Sometimes, when I get pretty invested in a blog, I like to look back at their very first post. It's so fun to see what brought them into this blogging world, and what they blogged about when they basically had zero followers. 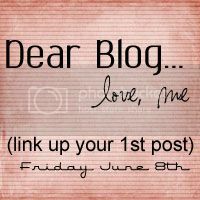 Tomorrow, I'm putting together a "Dear Blog" linky party where I would love for you to link up your very first post! It will be super easy to participate, considering you've already written it! All I ask is that you would add this button somewhere on your blog today, tomorrow, and the rest of the week to let people know! The more the merrier! Come on, let's go back to the beginning.